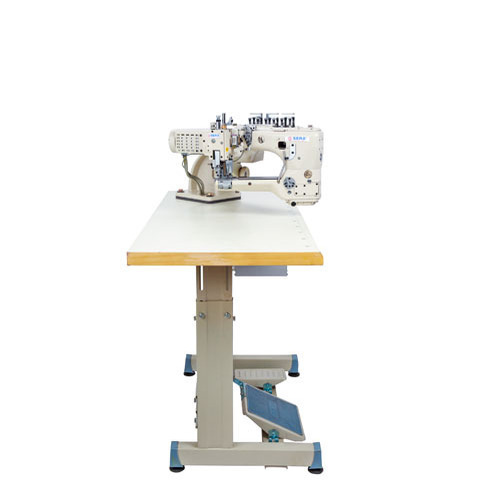 Banking on the skills of our qualified team of professionals, we are involved in providing 4-Needle Interlock Flat Seamer Flatlock Machinewith Double-edge Fabric Trimmer. This 4-Needle Interlock Flat seamer Machine with Double-edge Fabric Trimmer is known for its flawless operations and long service life. The flat seamer machine joins the two edges of the fabric from center allowing to trim the excess fabric collected in the waste bucket with the help of air suction. The flat seamer machines are highly used for garments like gymwear, sportswear, leggings, under garments, orthopaedic bandages, etc. Incepted in 1960, R. K. Sewing Machines ventured the international arena as an supplier of sewing machines & spare parts. In our due course of business, our consistent efforts have propelled us to expand our product gamut. Presently, we are introducing "SERA" - a new-generation sewing machines from Taiwan for industrial usages. Introducing ''SERA'' The SERA range includes new high speed sewing machines from Taiwan incorporated with advanced Japanese technology. It offers an interestingly special range of button hole, button sew and bar tacking besides basic sewing. These machines are convenient to be used on various types of fabrics & garments like suits, jeans, work wears, knit wears, swim wears and under wears.